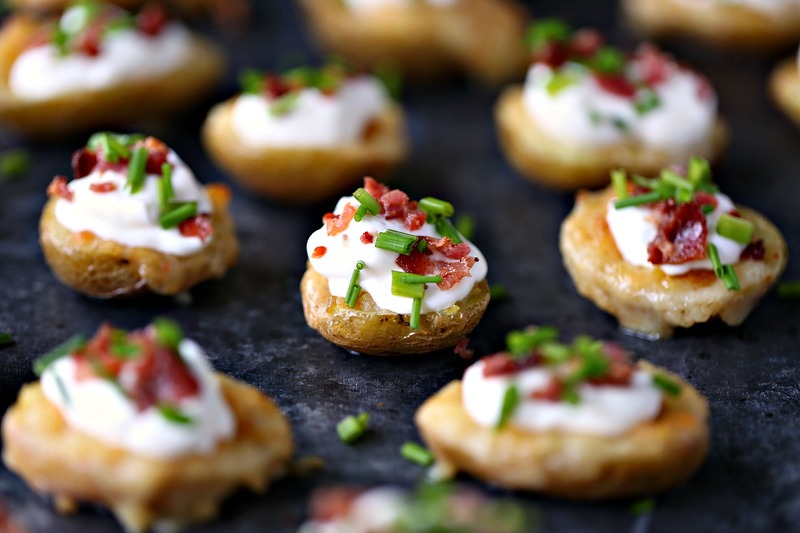 This recipe for Mini Potato Skins with Sour Cream, Bacon, and Chives is simple and delicious. These little bites are perfect for entertaining, especially during game season. Click here to PIN these Mini Potato Skins with Sour Cream, Bacon, and Chives! I love football food. There is something about game day food that just puts a smile on my face. Any chance I get to make itty bitty food is a good day in my book. 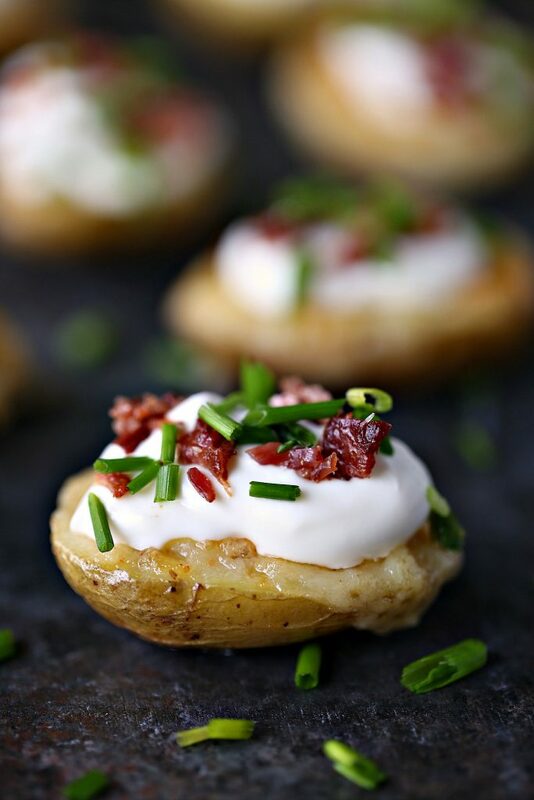 Potato skins are a family favourite. They are so versatile and the possibilities are endless. You can top them with so many different options. You can keep it simple or go completely crazy with toppings. 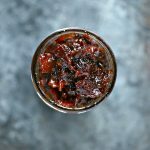 I chose to keep things a bit simple for this recipe. 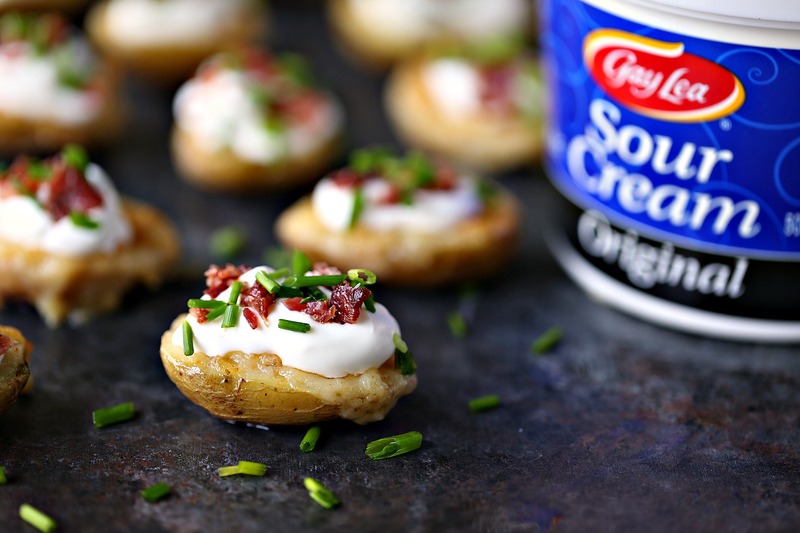 I topped my mini potato skins with Gay Lea Sour Cream, chopped bacon, and chives. The result is one seriously tasty bite that packs a flavour punch. Game day food is all about portability. So bite size food is perfect for football parties. 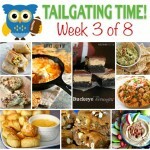 Tailgating parties are all about having a great time with fabulous friends and amazing food. I used Gay Lea Unsalted Butter in the potato filling, combined with Tex-Mex cheese. 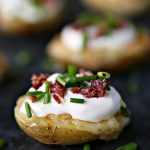 The result is a flavourful filling that pairs perfectly with the toppings on these potato skins. These are not very hard to make. Set aside about 45 minutes to make them if you’re pretty quick with scooping out little potatoes. If you are not adept scooping these will take an hour. Once you make twice baked potatoes a couple of times the scooping becomes second nature. You get quicker at it over time. Practice makes perfect, just like with anything else. This month Gay Lea announced our theme would focus on Dad’s or Dude Food. I’m totally down with this theme because I’ve often been told I eat like a dude. My appetite is very “football food”. Daily. I also happen to cook for dudes. My hubs and my son can eat their weight at each meal. They love variety and have huge appetites. They’re also really open to new foods and experimenting with new flavours. Potato skins get gobbled up super fast in this household. We all have huge appetites and love great food. So every day in the kitchen is a delicious adventure. 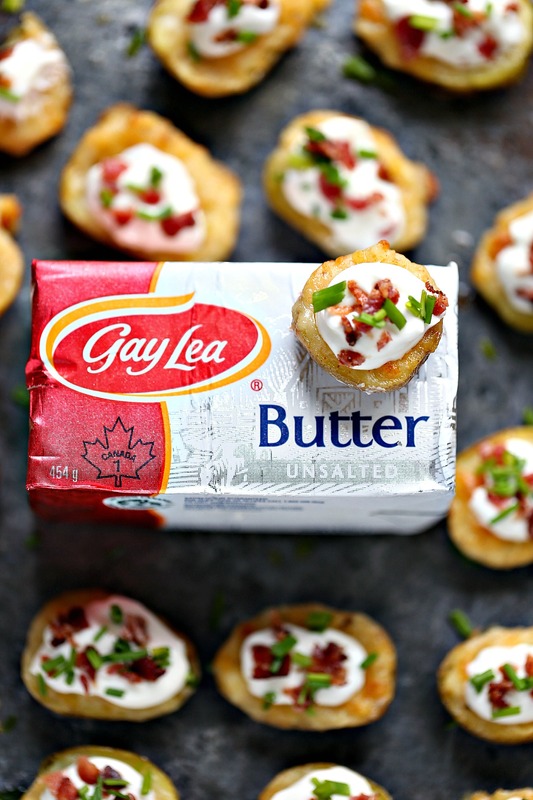 When you make these be sure to use Gay Lea Unsalted Butter in the filling for the potatoes. The creamy flavour works perfectly in this recipe. Butter and potatoes are everything. You are going to want to shove about a million of these in your face. They are scrumptious and perfect for game day or just a night at home hanging with the dudes. 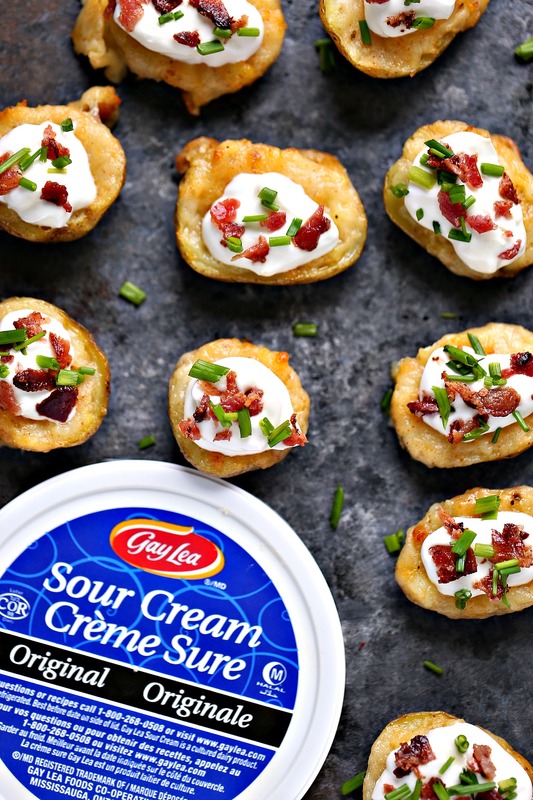 Stock up on lots of Gay Lea Sour Cream to top these potato skins with. Pile it high, then higher, then maybe a bit higher. Then top them with some chopped bacon and chives. Let’s get this party started by checking out the recipe. Make sure you always read over recipes twice before making them. It’s sort of like tool rules: measure twice, cut once. Make these today. I highly recommend double batching this recipe. These suckers get gobbled up so fast you want plenty on hand at all times. Trust me. Make once, eat twice. Score! In a medium size bowl combine clean potatoes and 1 tablespoon olive oil. Mix until potatoes are coated with oil. Transfer to cookie sheet. Place cookie sheet in oven and bake for 20 to 25 minutes. Potatoes should be soft in the middle but still holding together well. Test the potatoes by pricking them with a fork. If the fork slides in and out easily the potatoes are done. Remove potatoes from oven and allow to cool before handling them. You can place them in a bowl in the fridge for 10 to 15 minutes to speed up the process. Cook the bacon while the potatoes are cooking or cooling. Once the bacon is crisp allow it to drain on a paper towel to soak up any excess grease. Chop finely. Set aside. Grab a medium size bowl for the potato filling. Keep nearby. Once the potatoes are cool cut each one in half lengthwise. Use a spoon to scoop out the inside of each potato into the bowl, allowing 1/4 inch base on each potato. Place all the potatoes cut side up on a parchment lined cookie sheet. Grab the bowl of potatoes, use a fork to mash them up by hand. Add butter, cheese, salt, and pepper. Mix until smooth. Using a spoon transfer filling to the cut potatoes you set aside on the cookie sheet. Spoon evenly into each potato. Drizzle the potatoes with remaining 2 tablespoons of olive oil. Place the cookie sheet back in the preheated 425 degree F oven and bake for about 8 to 10 minutes, or until potatoes are golden brown. Transfer potatoes to a platter. 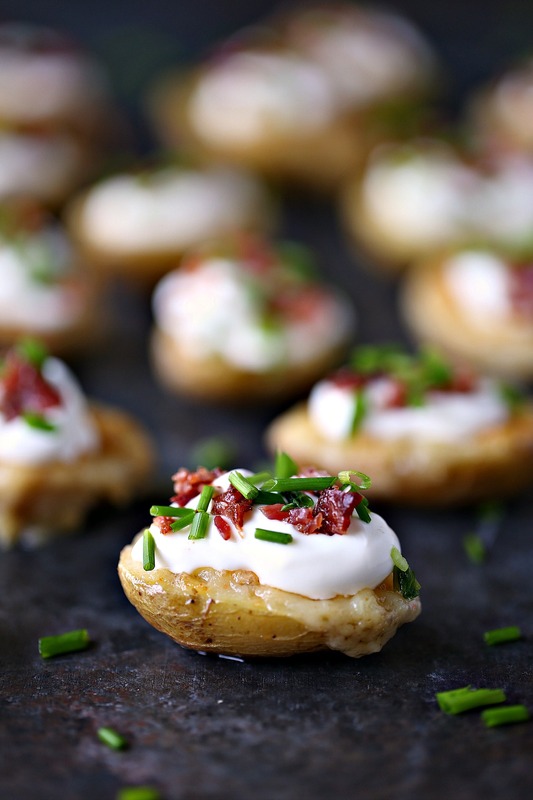 Add a big dollop of sour cream to each potato skin. 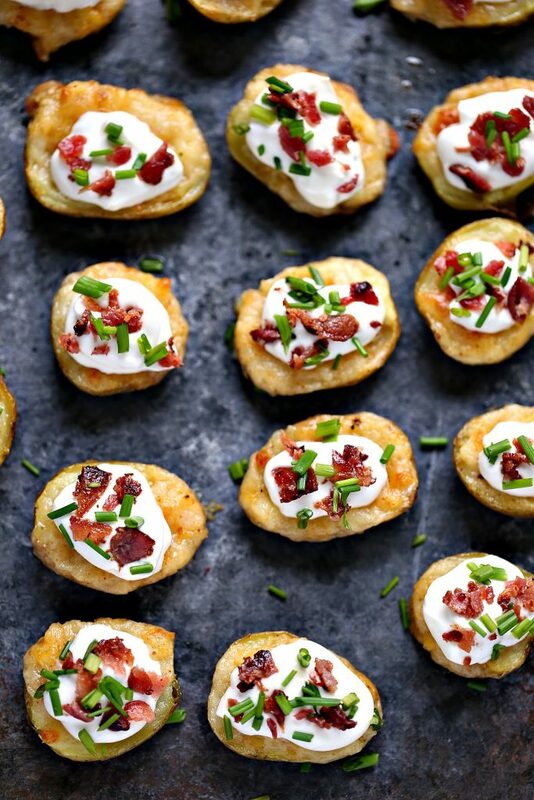 Toss chopped bacon on each potato skin. 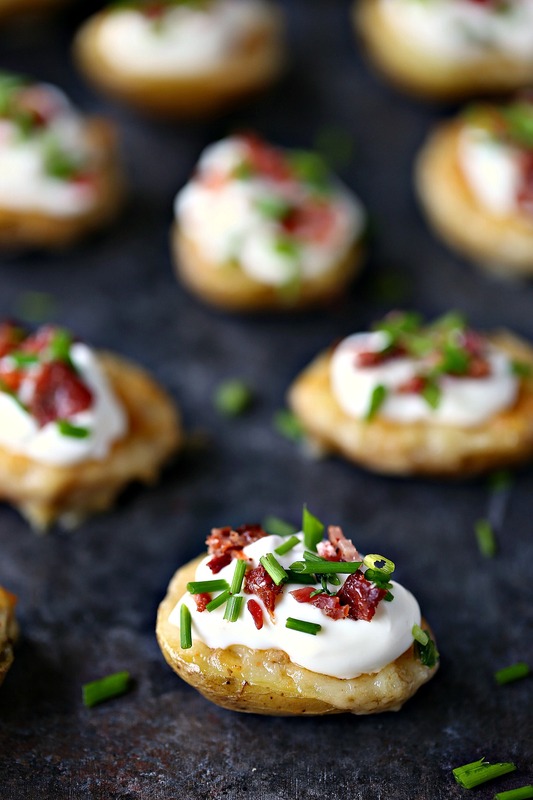 Sprinkle chives on each potato skin. 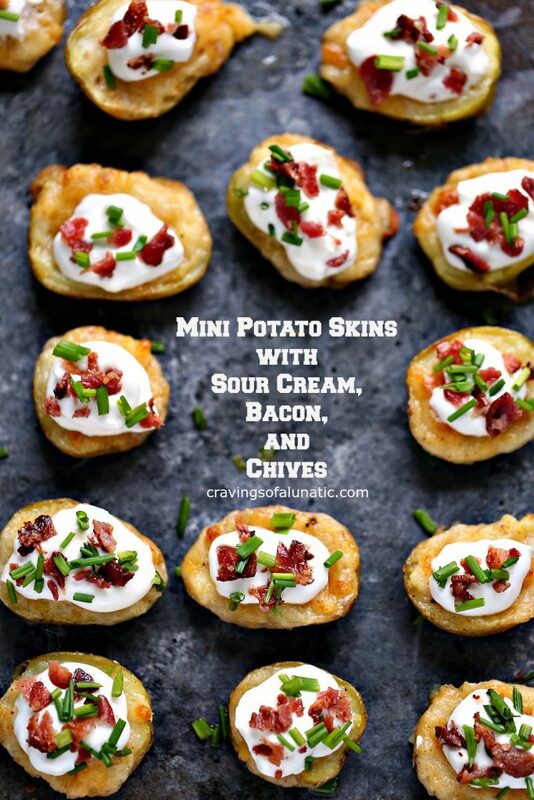 Devour each potato skin! Ha! 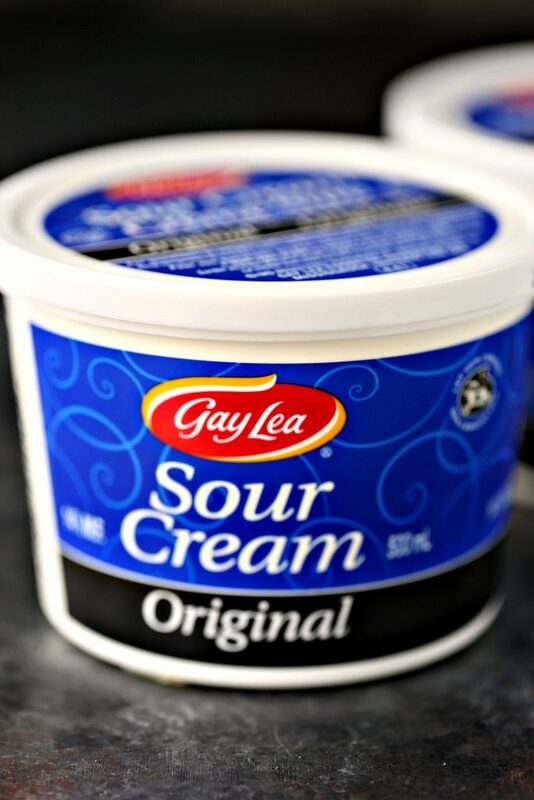 Serve with a big old sour cream loving smile! Aren’t these just the cutest thing ever? Dude Food just got more adorable! 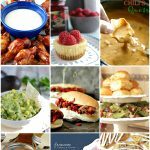 Swing by my recipe index for more tailgating recipes and football food. 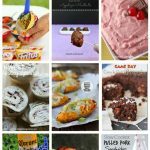 You can check out my other Gay Lea Recipes, like my Brown Butter Garlic Parmesan Pasta, and my No Bake Coconut Macaroon Cheesecake Parfaits. 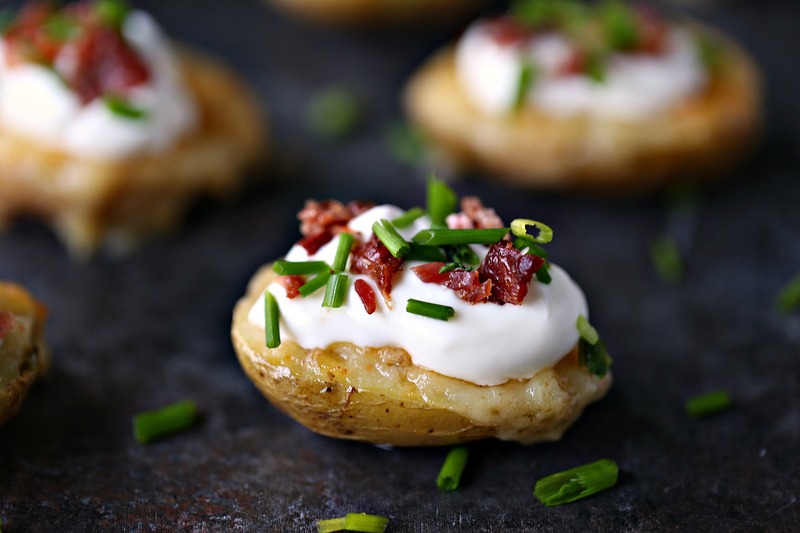 PIN THESE MINI POTATO SKINS WITH SOUR CREAM, BACON, AND CHIVES! Kim–These are perfection and your photos are stunning! Potatoes plus butter and sour cream are this mid-westerners dream come true. 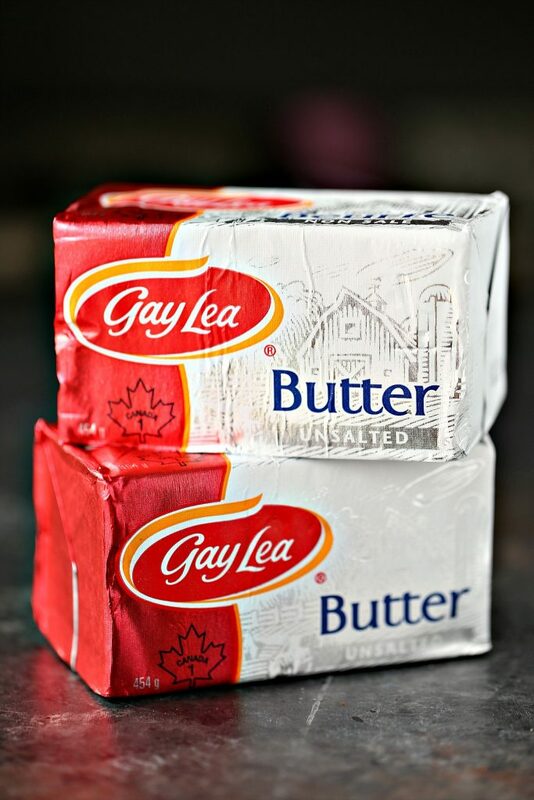 And it is so important to use good quality butter–which Gay Lea is just that. Thanks so much Kristen. I swear I should either live in the south or the mid-west considering my food tastes. I love Gay Lea. Such great products. So proud to be working with a brand I’ve used my whole life. Your pictures are so good. 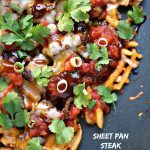 Love this recipe idea. I’ve got all the ingredients except the sour cream. Maybe I can substitute with greel yogurt? 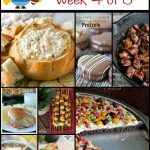 Found you on the inspire me monday linky party! Hey. Absolutely. We have one family member who has issues with sour cream so we always make a few with greek yogurt so they can indulge too. Tastes amazing both ways. Thanks so much for stopping by. Hope you love them. This might be “dude food,” but it’s also “portion control” food. I love it! Thank you for bringing us these wonderful bites. Bookmarked! Ha, no doubt. I ate way too many while taking photos. Thanks so much for the giggle and the compliment. These look so good! My boys love handheld foods! Thanks so much Liz. My guy loves handheld foods too. I’m a bit of a sucker for them too. I always tell people my food choices are pretty much that of a teenage boy. Ha! I freaking LOVE potato skins. LOVE this mini version!!! I feel the same way. I’m a sucker for tiny food. These look absolutely delicious! I think I’ll make them for Super Bowl! Thanks for the recipe! Great Big game thing 🙂 Thank you and have a nice day ! mmmm loaded potato skins are some of my fave appetizers and yours look awesome! Thanks so much Kayle. We love for game days and parties. Seriously yummy. Beautiful pictures and the food looks amazing. I am adding to my Pinterest queue. Thanks so much Jae. I appreciate i.